When I reviewed A Royal Affair last year, I spoke about the two big challenges that any period or costume drama has to overcome. One is the reputation of the genre as one obsessed with surface rather than substance, and clothing rather then character development. The other is the issue of pacing, needing to capture an historical period with its slower technology and pace of life whilst also needed to tell a story at an endurable pace for modern audiences. While Nikolaj Arcel's film ultimately came through both tests with flying colours, Amadeus is only a partial success. It's an overly long film of two halves, which begins as silly and as frothy as one can get, and ends as something of a weighty, murky drama containing compelling ideas. It is as sumptuous as it is silly, and irritating as it is intriguing, but it does ultimately come through with the goods before it has completely overstayed its welcome. Before we get to the meat and drink of Amadeus, it's worth taking a moment to address the issue of historical accuracy. It's something which can be boring to talk about, and which is often dragged up to discredit a film as it tries to garner awards. We can all think of examples of films which blatantly and consciously distort the truth, such as U-571, which credits the Americans, not the British, with cracking the Enigma code. But while capturing period detail should be praised on a technical level, historical accuracy is not a sign or guarantee of a good story. Film is a narrative medium, and with subjective allowances for taste and respect for an audience's intelligence, telling a good story is more important than getting the facts right. In the case of Amadeus, we are confronted with a story which is at best a long-discredited theory and at worst an utter fabrication. There is little or no evidence to suggest that Antonio Salieri was responsible for the death of Wolfgang Amadeus Mozart; the fact that he taught one of Mozart's sons would suggest that they were actually on friendly, or at least respectful, terms. But neither the film nor Peter Shaffer's play have historical accuracy as their prime motive. Both are more interested in telling a story about how rivalry manifests itself, and the relationship genius has with a world either not ready for it or unwilling to accommodate it. The question that follows is whether Mozart's life is the right vehicle for this kind of story, whose ruthless, scheming character might be more suited to a political thriller. When The Iron Lady was released, the director Phyllida Lloyd said she had wanted to make a film about dealing with age - the obvious criticism being that she could have told that story without making a biopic of Margaret Thatcher. In this case, however, Mozart is the ideal topic or vessel for this kind of story. His reputation and character fit closely with our cultural notions of what genius is, allowing Shaffer and director Miloš Forman to get on with the storytelling. While the story itself is not problematic (at least not as a piece of entertainment), the storytelling in Amadeus is perhaps its biggest problem. The opening scenes look absolutely gorgeous: Miroslav Ondrícek, who worked with Lindsay Anderson on If...., pulls the audience in with a series of elegant, painterly images. But once the credits end and the action moves indoors, everything becomes very stagey. 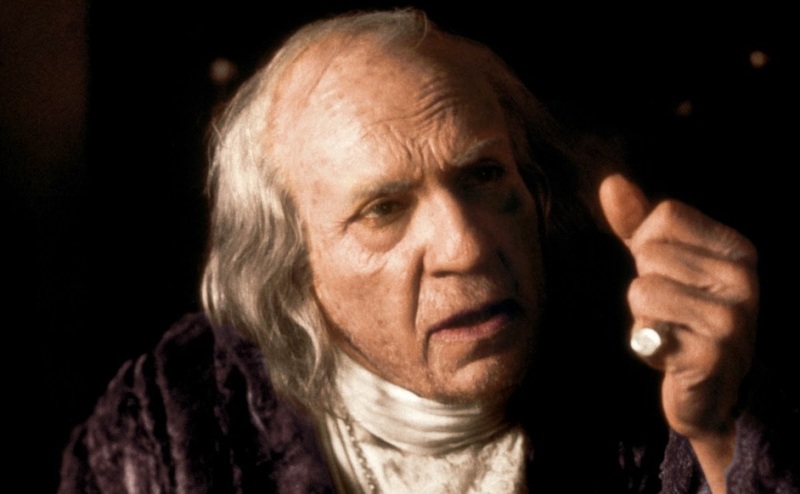 The framing device of the elderly Salieri, relating his story to a priest in the asylum, is not successful, and the film works better the less it is employed. 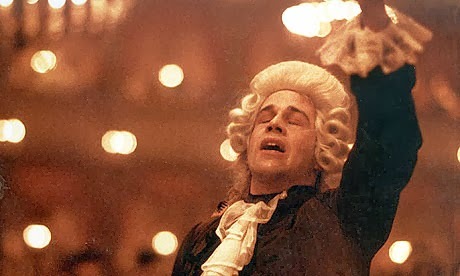 For most of its first hour, in either of its cuts, Amadeus is essentially a silly, frothy, overblown costume drama. It is far more interested in the costumes, the huge wigs and the pompous characters that wear them than it is in the creation of the music or the personalities behind it. The film employs broad comedy, usually in the form of fart jokes, and its recreation of opera is completely ridiculous. 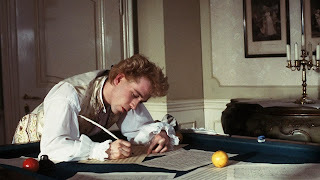 It doesn't have the grace or the understatement of Barry Lyndon, and makes you appreciate the comparative meatiness of The Madness of King George. Matters aren't helped in this regard by the annoying nature of the central character. Tom Hulce, a graduate of Animal House, is a good actor who clearly threw himself into the part: having never played piano before, he practised for more than four hours a day upon landing the role. But while his skills are not in doubt, his Mozart is one of the most annoying and excruciating characters outside of an Adam Sandler comedy. Just as we aren't supposed to hate Salieri, so we are not expected to entirely like Mozart. But all his juvenile qualities are overplayed and repeated ad nauseum: it's not so much "too many notes" as too many laughs. As a result of both the framing device and the juvenile tone, we spend the first hour distant from our main characters. We are distant from Mozart because he's an irritating little twit, and we are distant from Salieri because his narration keeps interrupting the action. As a result the jealousy and scheming on the latter's part feels like a deliberate plot device rather than a natural result of their relationship. The words are still pleasant on the ear, but you are left wishing that Shaffer could write more like his namesake Anthony Shaffer, creator of Sleuth. About halfway in, specifically the section concerning Don Giovanni, Amadeus begins to pick itself up and grab its core themes by the scruff of the neck. The death of Mozart's father, and the composer's accompanying decline into illness, give the film not only a darker tone but a depth that it didn't have before. The serious reaction to a tragic event gives the film more credibility: by taking the matter seriously, it allows us to take the characters more seriously and for Salieri's subsequent actions to carry more weight. The film merits a comparison in this regard with Rush, Ron Howard's thrilling drama about the rivalry between James Hunt and Niki Lauda. Both stories concern a rivalry between two talented men, but this rivalry is initially presented in a broad, overly playful way; the film is still entertaining, but we are conscious of how little is going on between its ears. Then something dark or unfortunate happens to one of the men which gives the drama a stake and the rivalry a meaning. Going dark is by no means a guarantee of a good story, but in both cases it is just what the films needed. The main theme which this dark turn enables to unfold is the conflict between genius and mediocrity, and how graceless the two can be. Mozart's genius is confronted by mediocrity on all sides - from Salieri, whose position as court composer is threatened; from the Prince, who has very limited taste; and from his courtiers who don't want their power to be undermined. Neither Mozart nor Salieri conduct themselves well, with Mozart foregoing all decorum to defend his compositions, and Salieri working behind the scenes to bring about his downfall. Mozart's lack of social grace is mirrored by Salieri's lack of morals. The role of parents in Amadeus is a key one. 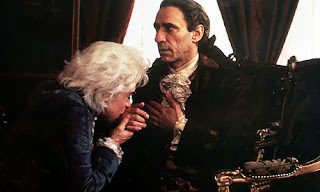 Salieri's father discourages his son's ambitions, and his death serves as a (misplaced) vindication for Salieri, of both his Catholic faith and his musical ability. Mozart, by contrast, is spoiled rotten by his father, who recognises his abilities but struggles to contain them beyond presenting Mozart as a performing monkey. When his father was alive but out of the picture, Mozart is free to make a name for himself in a carefree manner - but with him dead, this carefree nature gives way to a desire for atonement, which leads him to work obsessively on the unfinished Requiem. The film is also interested in Catholicism, specifically the role God has in meting out talent and answering prayer. Salieri's prayers go unrewarded since he is asking God for the wrong things in the wrong way, seeking to curse rather than love his enemies. At the end of the film, he comments that "God killed Mozart" rather than let him share in any part of his talent, including the transcription of the Requiem. While the film's theological understanding of gifts is not entirely sound, it is an interesting lens through which to view and depict jealousy. 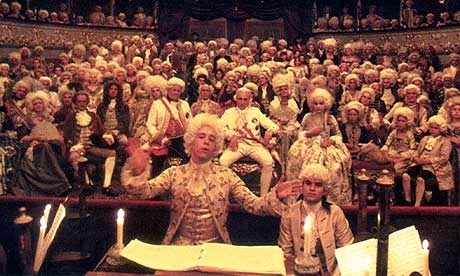 Much of the success of Amadeus lies in its music. Even in its weaker first half the music is wonderfully produced, conveying to us how great Mozart was instead of having people simply state his greatness, as in Gandhi. More importantly, Forman does succeed in making the creative process of writing and composing both cinematic and exciting. In one really special moment, Salieri flips through Mozart's portfolio, and hears the music on the page perfectly formed in his head. It's a wonderful moment which F. Murray Abraham superbly executes, keeping his character on a tightrope between envy and euphoria. 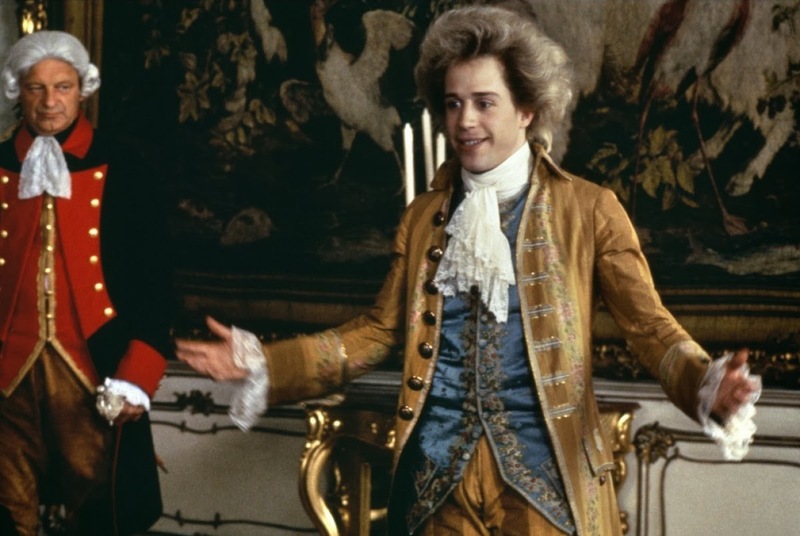 Amadeus is a film of two distinct halves, with the virtues of its substantial second eventually winning out over the frothy excesses of its first. Once you get past the costumes, the wigs and the irritating laughter, it does become an interesting, memorable cinematic venture with a brace of pretty good performances. It doesn't quite deserve the reputation that won it the Best Picture Oscar, but among even that select group of films, you could do a hell of a lot worse. For a more in-depth discussion of storytelling and the role of darkness in drama and tragedy, check out JesuOtaku's review of Madoka Magica here. It contain some very good advice for writers about genre and audience expectations. "...at best a long-discredited theory and at worst an utter fabrication." The play/film Amadeus is loosely based on a 19th century novel and serves as a fable that touches on issues of faith, betrayal and artistic jealousy. It is meant as a fictional cautionary tale that serves as a backdrop for the major themes and never meant to be taken as history.. Yes, that is a third option. The point I was making was that anyone wishing to take Amadeus as the historical equivalent of gospel truth will very quickly come a cropper.